Is your snoring loud enough to wake the dead or make anyone sleeping next to you wish they or you were? This may sound like an extreme statement, but living with continuous snoring can have that effect. Don’t get a teddy bear thrown at your head, don’t get a divorce. Sinus congestion is often a culprit in causing snoring. Using a humidifier in your bedroom will help loosen secretions and make you less likely to snore. You can also purchase a pillow designed to elevate your head and allow for freer air passages. 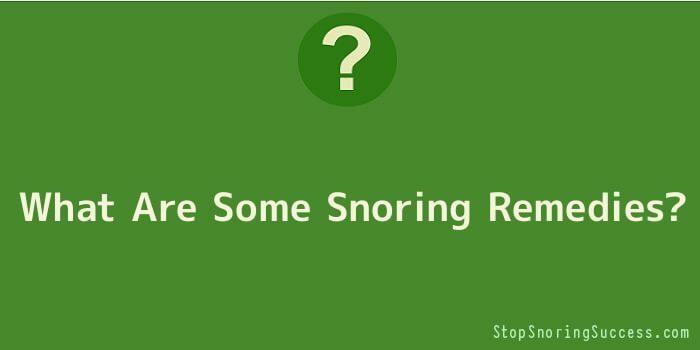 Dietary changes should always factor in strongly when seeking out snoring remedies. Smoking irritates the membranes in the nose and throat, which causes blockage in your airway passages. Keep in mind that exercising to strengthen your legs, belly, and arms also tones your throat. And losing weight will help decrease any fatty tissue in the back of your throat that is making you snore. Although no one snores on purpose (at least when asleep! ), the stress of the unrelenting noise on the snorers spouse or partner can drive him or her from the bedroom and sometimes from the relationship altogether. If there is anything the partner of a chronic snorer knows it’s this: Even if you never go to bed angry, you can still wake up furious. Talking about the problem is must to diffuse any rage on the part of the snored-at at the snorer, which is only human but misses the point. It’s not an intentional auditory assault, but a condition that needs to be addressed and solved to restore harmony within a relationship. Snoring remedies sometimes by necessity are more involved in nature. Here are some signs that snoring may be indicative of a bigger problem requiring medical attention: If you notice that your partner chokes or gasps for air while sleeping, this could be a sign of Sleep Apnoea, which causes oxygen deprivation during sleep. Depending on the cause of the problem, use of a CPAP machine or laser surgery are two curative options.